C&T Q&A – How Do I Drive Consistent Sales in my Online Shop? My biggest dilemma is getting consistent sales. It’s so hard to predict, there may be weeks where I get 3 sales and then a period where there is none. I know you are a consistent blogger and tweeter, so your online presence is really strong, but do you think that’s what constantly drives your sales? Or is there another avenue that you see more results from? Are the majority of your sales from repeat customers? This is a really fundamental question – because without consistent sales, you don’t have a business that can support you. To bring in consistent sales, you really need to be bringing in new customers consistently. Because yes, repeat customers are awesome – but depending on the nature of your business, they may only account for a small part of your overall sales. If you sell handmade soap, for example, repeat customers might be a big part of your business – because they fall in love with your soap, and come back to buy more again and again. Soap runs out, after all! However, if you’ve got a business like Kate and I (jewellery) repeat customers will be a much smaller minority. For example – sterling silver wedding bands have become a huge part of Epheriell’s business nowadays A wedding ring is (hopefully!) a once-in-a-lifetime purchase, so it’s not something they’ll need to return to me to buy again. Of course, I hope that they are so impressed by my craftsmanship that they do come back to buy other jewellery from me! But you get the idea. So. Bringing in a consistent flow of new customers – while treating your return customers like the absolute gold they are – should be what you’re aiming to do. Working out how to do this effectively is the Holy Grail of all business. Everyone does it differently – so I’m going to share what works for me and my business in the hope that you’ll get some ideas! Epheriell is marketed solely via blogging, social media, a mailing list and renewing listings on venues like Etsy and madeit. I do maybe 1-2 markets a year, and I can’t remember the last time I bought any advertising. When you market like I do, you rely on one thing to keep the ball rolling – consistency. To reply to what you said Kate, I do think that my daily, consistent, regular effort to be visible online is what keeps my sales coming in. In fact, I know it is the case – because when I’m offline for any length of time (days etc) and I’m not doing my regular blogging/social media/renewing etc, my sales drop down. They don’t disappear, because I have built up a certain level of traffic to my shop via search engines etc, but they do slow a little. Here’s a little breakdown of some of what I do to keep Epheriell visible and therefore keep the sales flowing. I send out an email to my Silver Service subscribers, telling them something useful, sharing a story about my work, giving them a special treat etc. Yes, it’s a lot of work. But without it, I wouldn’t have a business. I spend at least as much time marketing my brand as I do actually making jewellery. 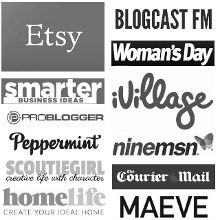 The balance has shifted over the years – when I started out, I reckon about 90% of my working time was spent on marketing and ‘business-y’ stuff, whereas now that I have an established brand, I can spend much less time on this, and more time making jewellery (or working on other projects!). If you’re not currently devoting a decent amount of your time to the marketing side of your business, you’re shooting yourself in the foot. If you’re yet to discover what combo of marketing activities works for you – keep experimenting! It’s the only way to figure it out. And, of course, at the most fundamental level – make sure you’ve got a gorgeous online shop full of products people really want to buy before you do anything else. How much time do you spend marketing your business? What’s the balance between making & marketing for you right now?